Whew, week three done! Rather getting into this technical challenge lark. 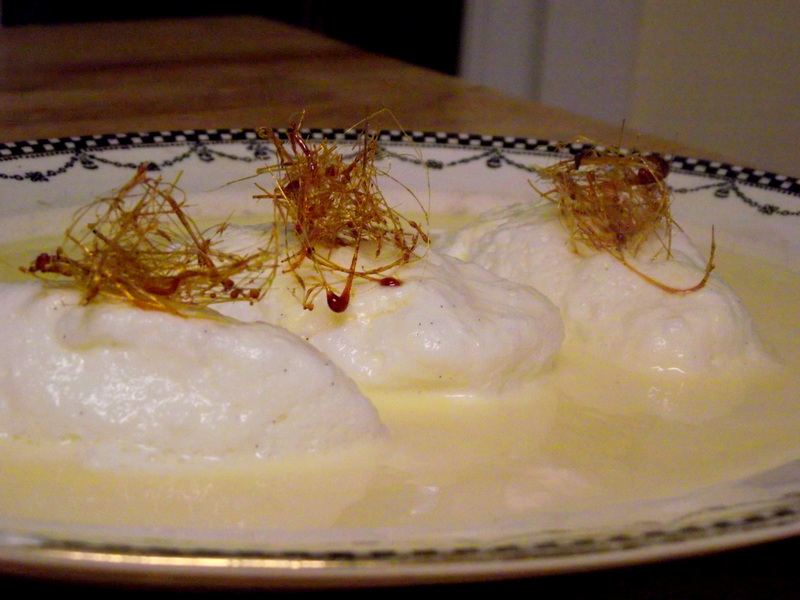 This week’s dessert, Floating Islands, probably ranks somewhere in between the previous two in that 1) it wasn’t overly tricky but 2) I still made a bit of a hash of it. And after all that, you are just left with eggs… floating in eggs… Which is all very well, but I prefer mine fried, in a sandwich. The creme anglaise was delish, but so are most things made from cream, egg yolks and sugar. 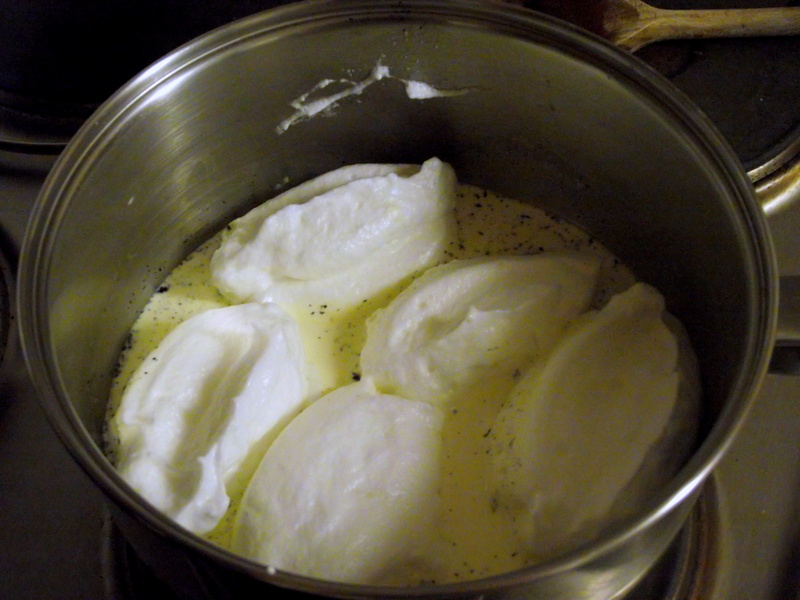 The floating quenelles seemed to go quite well until the moment when you’re supposed to flip them – Mazza B doesn’t give much instruction on this, but from experience I can tell you that in an overcrowded pan they will just disintegrate. If you don’t have a wide, deep pan you would be well advised to do these in batches, straining the milk/cream each time. The recipe, as always, is on BBC Food. 1. Set the milk, cream and vanilla to heat in a wide, deep pan over a very low heat until barely simmering. 2. Whisk the egg whites in a large bowl until stiff peaks form, then add sugar one tablespoon at a time until beautifully thick and glossy. 3. 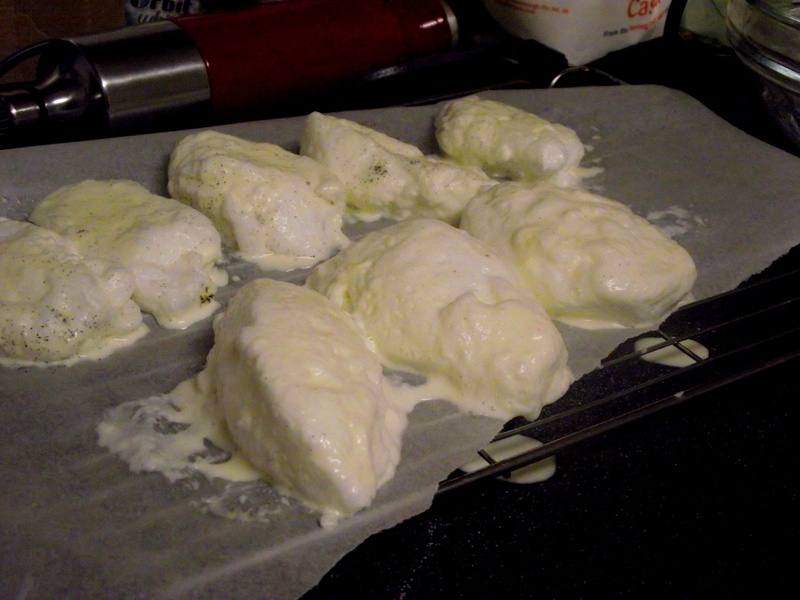 Shape your meringue into quenelles by passing a scoop from serving spoon to serving spoon until it is nice and neat. 4. Lower each quenelle onto the milk, but not so they’re as crowded as in the picture below – you need enough space to manoeuvre them about a bit. 5. Pop a lid on and poach for 10 minutes or so, flipping halfway through. It’s best to do this with a rubber serving spoon to minimise damage, but if they really don’t want to be flipped it’s not the end of the world. Just don’t let the milk boil, as terrible things will happen. 6. 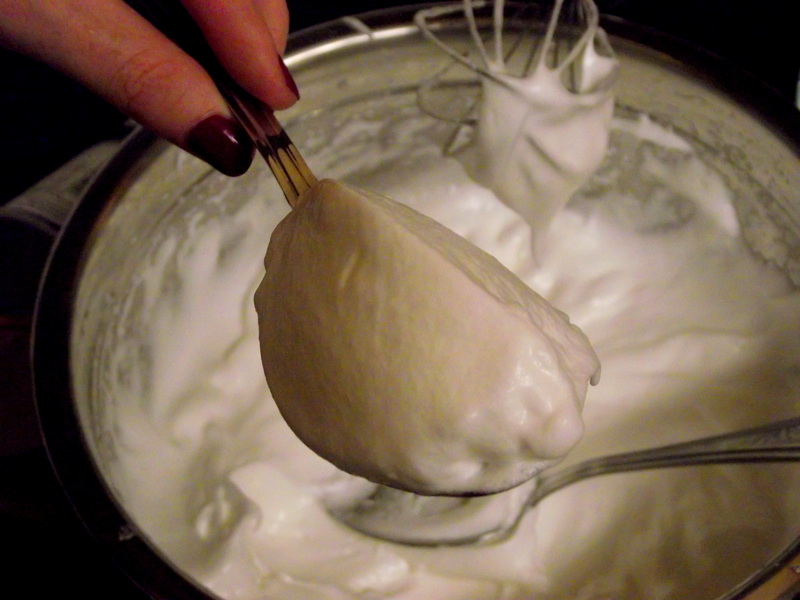 When they’re nice and firm, remove to a draining rack and, if necessary, strain the milk of any stray meringue and put in a second batch. 7. 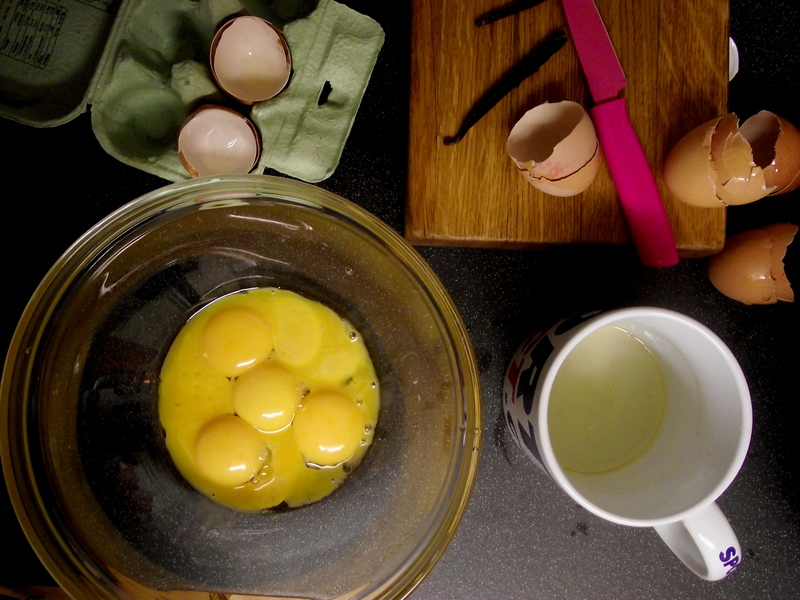 In a large bowl, whisk the yolks and sugar until pale and fluffy. Pour in the warm milk, whisking continuously, then return to the pan. 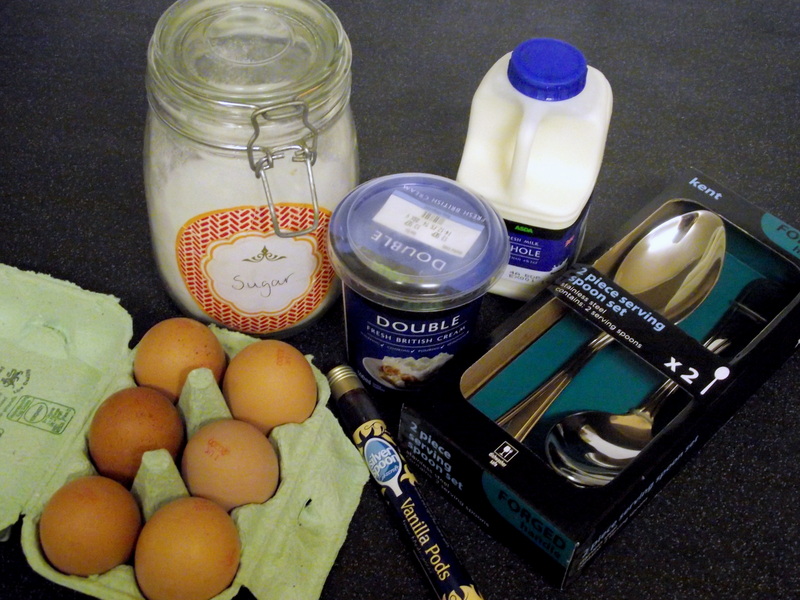 Cook over a very low heat for 3-4 minutes until the custard coats the back of the spoon – it doesn’t need to be thick. 8. For the spun sugar, melt the sugar without stirring in a small metal pan until golden brown. Remove from the heat and leave to cool until it forms strands from the end of your fork (it may be worth having an ice bath on standby as mine continued to cook). Flick over a greased rolling pin, then gather into balls. Watch out for splinters. Seriously. 9. 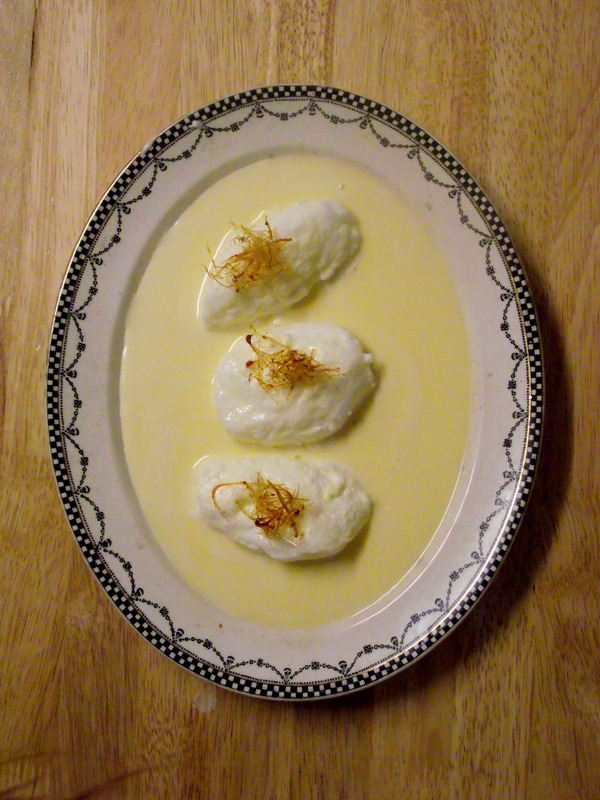 To serve, pour a little custard into a bowl, and float an island on top. Finish with the spun sugar, then wonder why you are eating egg in an eggy bath.